One down, three Premier League clubs still left in the Europa League. Southampton march into the play-off round after a thoroughly professional performance while Liverpool and Tottenham don't get started until the group stage. As for West Ham? Slaven Bilic will want to quickly put this behind him and concentrate on his side's opening Premier League game against Arsenal on Sunday. Thanks for your company. Don't forget you can follow the closing stages of Aberdeen's Europa League tie on the BBC Sport website. We started very brightly but got stuck in a bit of rut. Where we lost it over the two legs was at home. We are disappointed as a squad and team because we wanted to go through. The gaffer has shown in his selection that the main priority is the Premier League and to make sure we go to the Olympic Stadium in the Premier League. Who knows it might be a blessing in disguise. I'm not saying it's what we wanted." Will Aberdeen join West Ham on the Europa League scrapheap? There's around half an hour left and they trail 3-1 on aggregate to Kairat Almaty. You can follow the action here. Southampton will join the likes of Ajax - another of Ronald Koeman's former clubs - and Fenerbahce in the hat for the play-off round draw which takes place on Friday and will be contested over two legs on 20 and 27 August. After the play-off round it's the group stage, where Tottenham and Liverpool enter. West Ham are out of the Europa League. They were 2-0 and 3-2 ahead on aggregate but crash out after fielding a young side. Lots of theatricals as Astra run down the clock. West Ham's bench is awash with frustration. Southampton are safely through to the play-off round. Will West Ham be joining them? It should be game over. Denis Alibec hits the post with the Hammers defence all over the place. Four minutes of added time. Into the last few moments in Romania. Big chance for West Ham. Diego Poyet does well down the right before finding Modibo Maiga at the far post. He tees it up and swivels a shot wide. They're into the final minute in Arnhem and Sadio Mane doubles Southampton's advantage on the night after racing clear and firing low beyond the keeper. It's been a one-sided tie. A fine flying save by Darren Randolph keeps the Hammers in the tie as he produces a spectacular stop to keep out Denis Alibec. Time running out for West Ham. Jay Rodriguez might have been out of the game with a serious injury but he's lost none of his confidence in front of goal. The Saints foward unleashes a terrific 25-yard effort which flies just over the bar. Ten minutes of normal time remaining in Romania. It's a last throw of the dice for West Ham - young forward Jordan Brown is on for Elliot Lee. West Ham may be struggling, but at half time in Germany it remains Dortmund 0-0 RZ Pellets. That's despite the Germans having 92% of the shots - they still lead 1-0 on aggregate. Steven Davis's night's work is finished. The Southampton midfielder gets a series of pats on the back as he takes a seat on the bench after being replaced by young Harrison Reed. It's been a highly professional performance by the Saints in Holland. West Ham are on the brink of a Europa League exit, and Aberdeen - another British side in action tonight - are 45 minutes away from going out at the hands of Kazakhstan's Kairat Almaty. It's half-time at Pittodrie and the Scottish side need to score - it's goalless on the night but they trail 2-1 on aggregate. Decent spell of possession by West Ham. Josh Cullen whips in a cross intended for Kevin Nolan but it's just about cleared before Elliot Lee heads a decent chance wide. Just over 15 minutes left. Remember Jay Rodriguez? The former Burnley forward has been out injured for more than a year but he's just come on to a tremendous reception from Saints fans, Graziano Pelle making way. One goal by West Ham will force extra time. They have little over 20 minutes to find it. Astra midfielder Filipe Teixeira makes way for Denis Alibec. First Saints change in Arnhem. Midfielder Dusan Tadic makes way for Spanish forward Juanmi. Ronald Koeman's thoughts are turning to Sunday and Newcastle. Half an hour left for West Ham's youngsters to prolong the club's Europa League adventure. There's no lack of effort but there's little cutting edge on show. It's not looking good. There's a very impressive number of Southampton fans who have made the journey to Holland. They're making plenty of noise. Vitesse are playing for pride, Valeri Kazaishvili forcing a save from Maarten Stekelenburg with a low shot from just outside the area. It's like an exhibition match over in Arnhem. There's little in the way of goalmouth incident so far in the second half, Southampton seem happy to run down the clock. So close to being 3-1 as the visitors fail to deal with another free-kick into the penalty area and Fernando Boldrin fires over from close range when he should have done better. Astra's boss Marius Sumudica whispered in the ear of Kevin Nolan as the teams made their way back out in Giurgiu. Whatever he said brought a smile to Nolan's face. The Hammers skipper needs to call on all his experience to help his side back into this. A big 45 minutes for Slaven Bilic and West Ham. The Hammers are back under way in Romania. No changes for Southampton as the second half gets under way in Arnhem. Ronald Koeman is looking very relaxed...and so he should. West Ham today named two more members of their backroom staff, but there is still no sign of Nicola Jurcevic joining the club as assistant manager. When he was appointed as new boss in June, Slaven Bilic indicated he intended to bring in Jurcevic, Edin Terzic and Miljenko Rak, all of whom he worked with previously at Besiktas in Turkey. Terzic has been appointed Hammers first-team coach and Rak head of performance, joining a set-up which includes Chris Woods as goalkeeping coach and Julian Dicks as a coaching assistant." More news from Arnhem about trouble which flared before Southampton's match in eastern Holland. According to the Press Association, 50 Dutch fans and three English supporters were arrested following the incidents. The issues arose in Korenmarkt, the city's bar district, where English and Dutch supporters had been drinking together peacefully. However, riot police and horses were called in after clashes began. Lawro's opponent for the opening round of Premier League fixtures is former England cricketer Graeme Swann. You can make your own predictions now, compare them to Lawro and other fans and try to take your team to the top of the leaderboard by playing the new BBC Sport Predictor game. Nine years to get back into Europe, 45 minutes left to keep their Europa League hopes alive. West Ham have it all to do. Our live text commentary of Aberdeen v Kairat Almaty is under way here. Just the 3,415 miles travelled by the Kazakhs for this one - the longest journey ever made for a European club tie. Kick-off is just a couple of minutes away at Pittodrie. Several hundred West Ham fans have made the journey to Romania. They're looking pretty miffed. They probably didn't expect to be seeing an under-strength team when they paid out for this trip. Here's the photo for the proof. Southampton boss Ronald Koeman suffered his own injury in training last night and has his foot strapped up for tonight's game. Disaster for West Ham. Another avoidable goal as Constantin Budescu gets his second goal in four minutes following a cut back by William De Amorim. The Hammers need two goals... quickly. Almost two for Southampton as Sadio Mane steals past the last man but sees his low shot blocked by the legs of Eloy Room. Oh dear. A total mess by the West Ham defence and the initiative is back with the Romanians. Constantin Budescu gets a low shot away 22 yards out, it flies through the legs of young defender Doneil Henry and beats keeper Darren Randolph for pace. Great block by Steven Caulker to deny Vitesse's Milot Rashica. 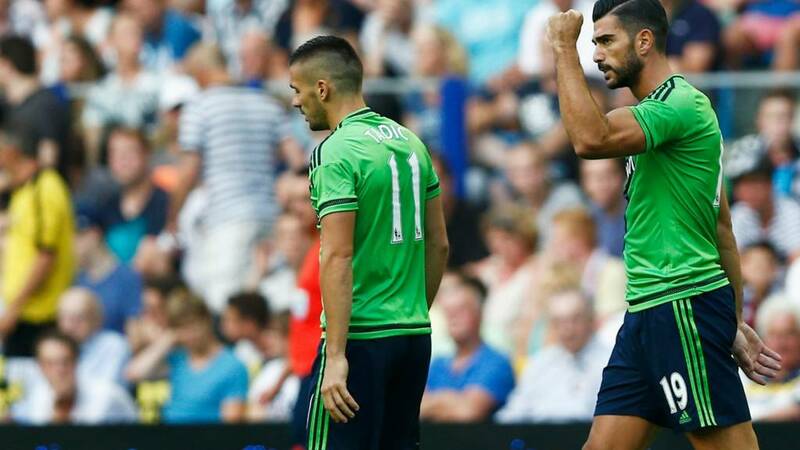 The Saints look home and dry but Ronald Koeman will demand a clean sheet. Astra are having loads of possession but they can't do anything with it. West Ham's young defence are doing a decent job. The first few whistles of frustration from the home fans have been heard. That will be music to Slaven Bilic's ears. All too easy in Arnhem. Southampton can start thinking about Newcastle on Sunday. They're coasting into Friday's play-off round draw. One thing is for sure, Ronald Koeman's injury won't be hurting as much as it did before kick-off. Early change for Astra. I'm not sure whether it's tactical or an injury but defender Ricardo Alves is off and on comes fellow defender Cristian Oros. Thomas Tuchel takes charge of his first Europa League game at home as the new manager of Borussia Dortmund, he's all smiles....for now! His side take a 1-0 first-leg lead against RZ Pellets. Under way in around 10 minutes in Dortmund. Let off for West Ham. New signing Darren Randolph makes a mess of Constantin Budescu's looping free-kick and the ball thumps against a post and rebounds to safety. It's all fairly comfortable for West Ham, despite all those fears about the Premier League club naming an under-strength team...Astra have not got going. Are West Ham right to name a weakened side and prioritise Sunday's league opener against Arsenal? Southampton are playing in lime green shirts. They might be leading but it's highly debatable whether they are winning in the fashion stakes. I can report Slaven Bilic is smiling. The West Ham boss might be banished to the stand but that did not stop him punching the air when his side scored. Goodnight Arnhem - what a start from the Saints. Graziano Pelle fires one low and hard, right into the bottom corner. The keeper had no chance and Ronald Koeman's side are off to a flyer. Surely that puts this one to bed already? Perfect stat for the Hammers. Argentine midfielder Mauel Lanzini wins possession before cutting inside and firing home. Astra's keeper gets a touch but it's way too powerful and the ball nestles in the back of the net. West Ham's reserves have the lead and the travelling Hammers fans are jubilant. There were a flurry of yellow cards in the first leg at Upton Park. And there's alreay been a couple of tasy challenges by the hosts on West Ham's player in the opening exchanges in Romania? Can the Hammers finish a match with 11 players? We're under way in Romania and Holland. Ready to go? It's make or break for West Ham. We're almost ready for the off. While Southampton manager Ronald Koeman limps his way to the dugout - he's hurt his achilles' tendon - brother Erwin has been talking to BT Sport. We played all of last year the whole year to play European football and now finally we have reached that. We have a 3-0 advantage but in football everything can happen, if we have a bad start. The boys are focused to get good result and progress to the next round. Great scenes inside Arnhem's Gelredome. The hosts might be trailing 3-0 but the locals have turned up in force. A sea of yellow and black as both teams emerge from the tunnel. Who are West Ham's debutants? Doniel Henry,Kyle Knoyle and Manuel Lanzini are all making their senior debuts this evening. Defender Henry, 22, is a Canadian international, who was all set to make his debut for the Hammers last season but ended up being shipped to Blackburn on loan instead. Knoyle is an 18-year-old full-back who has come through the legendary Hammers academy and is an England youth international. And Lanzini is an Argentine attacking midfielder, 22, who impressed in West Ham's recent friendly against Werder Bremen. It’s a bit frustrating that I can’t be on the touchline and in the dressing room [after being sent off in first leg] but Julian Dicks will do the team talk and we have prepared ourselves well. We have a strong belief in the team, the boys and the senior players. It’s a great chance for them to show us we can count on them. We started the competition very early, 22 June is not ideal, but Europe is important for us. Reports are coming in of clashes between rival fans in Arnhem. Police moved in after glasses, chairs and punches were thrown. Press Association Sport is reporting that Feyenoord fans were involved. Goals by Graziano Pelle, Dusan Tadic and Shane Long have put Southampton in a strong position against Vitesse but Saints boss Ronald Koeman is not taking any chances against his former club. Saints are away to Newcastle on Sunday but, unlike his West Ham counterpart Slaven Bilic, Koeman has brought his strongest possible side to Arnhem. "It's crazy to think about it, to throw everything away at the start of the Europa League legs," said Koeman, when asked why he had not rested some of his players. Fifteen minutes to kick-off in Giurgiu and Arnhem. It looks like a scorcher in Romania where West Ham boss Slaven Bilic is banned from the touchline following his 'dismissal' in the first leg. Southampton and West Ham are not the only British clubs in action. Manager Derek McInnes insists there is no need for Aberdeen to go "gung-ho" as they seek to eliminate Kairat Almaty from the Europa League qualifiers. The Dons trail 2-1 from last week's first leg in Kazakhstan, meaning a 1-0 win would take them through to the play-off round on away goals. "You don't have to score in the early stages of the game," said McInnes. "Ideally we will. There has to be a measured approach and intelligence as well passion." Our colleagues in BBC Scotland will have a dedicated live text commentary on that one starting shortly. Not quite the Beatles' Abbey Road album cover but West Ham's players did a pretty good job at trying to recreate the iconic image when they went walk about in Bucharest earlier. Giurgiu, situated on the banks of the Danube River, is about an hour away from Romania's capital by car. You can listen to radio commentary of West Ham's game from Nick Godwin for BBC London 94.9. Just use the 'Live coverage' tab above. Are West Ham right to prioritise their Premier League game against Arsenal on Sunday and name a weakened side this evening? From Arnhem to Southampton via Lisbon and Valencia. Will Ronald Koeman be celebrating wildly if Southampton score in Arnhem? Not likely judging by this tweet the Saints boss posted on the eve of the tie. Apparently Koeman has had a scan but is fit enough to take his place in the dugout at his former club. In contrast to Slaven Bilic, Astra boss Marius Sumudica has named his strongest possible side after making the West Ham tie a priority over the league. "The second leg against West Ham is all that matters now," the 44-year-old Romanian said after resting several players for a league game last weekend. Bilic in the firing line? Slaven Bilic has only been in the West Ham job two months but he could be facing flak if his gamble to leave most of the club's first-team players behind in England fails to pay off. Defender Carl Jenkinson and captain Kevin Nolan are the only two first team regulars in Romania ahead of West Ham's first Premier League game of the season at Arsenal on Sunday. "I don't like the excuse, I don't see it as a problem, it is a situation and I'm trying to cope with it," said Bilic. Have West Ham done the right thing by naming an under-strength team? Will they have a better Premier League season if they are out of the Europa League? Or should they been naming their strongest side despite Sunday's tough Premier League opener with Arsenal? West Ham make 11 changes from the first leg draw, with Sunday's Premier League trip to Arsenal in mind. Boss Slaven Bilic names three debutants - Doniel Henry, Kyle Knoyle and Manuel Lanzini. They will be guided by the expereince of skipper Kevin Nolan. Modiba Maiga starts up front. West Ham XI : Randolph, Knoyle, Jenkinson, Henry, Page, Poyet, Nolan, Cullen, Lanzini, Lee, Maiga. Astra Giurgiu XI: Lung, Alves, Seto, Enache, Budescu, Morais, Boldrin, Gaman, Teixeira, Queiros, De Amorim. Will we also be seeing a little something from Jay Rodriguez? The 26-year-old scored a cracker as Saints drew 1-1 with Spanish club Espanyol at the weekend, in what was his first appearance since suffering a knee ligament injury 16 months ago. Come on in the second half if Ronald Koeman's side are already home and hosed? Southampton subs: K. Davis, Cedric, Rodriguez, Reed, Juanmi, Targett, McQueen. Think you know your football? Test your expertise by playing our game and seeing how many results you can predict correctly ahead of the opening weekend of the Premier League season. Southampton manager Ronald Koeman hands debuts to defenders Steven Caulker and Cuco Martina in three changes from the first-leg 3-0 win last week. James Ward-Prowse comes in for injured midfielder Jordy Clasie, while Cedric Soares and Matt Targett make way. It's taken West Ham nine long years to get back into Europe but they could be tumbling out before the Europa League properly gets under way...unless they do the business in Romania. The Hammers were in the driving seat at Upton Park, leading 2-0 before James Collins's dismissal allowed Astra to secure a 2-2 draw. Kick-off in Romania is 19:00 BST - the same time Southampton start their second leg away to Vitesse in Arnhem protecting a 3-0 lead. "This is the beginning of a new adventure. We know the reward for winning the competition is a place in the Champions League and that is the ­ultimate dream." So said West Ham co-chairman David Gold upon hearing the Hammers would be playing competitive European action for the first time in nine years after qualifying through the Premier League Fair Play table. But just five games in and the dream is threatening to turn into a nightmare, with manager Slaven Bilic in the firing line, West Ham's discipline under scrutiny and European lightweights Astra Giurgiu threatening an upset. Can an under-strength Hammers team save the club from embarrassment in Romania?